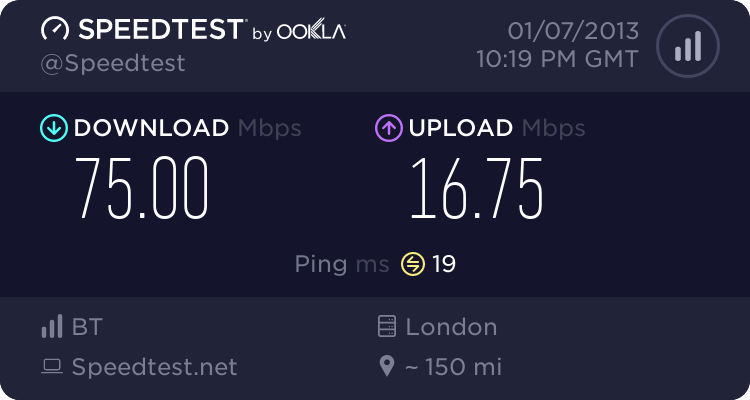 In the company I work for we use BT MPLS wan lines and then have BT adsl lines as a backup. * Both housed in the same computer room, in the same rack. * Street to the exchange same??? air con, power supply to exchange and physical ducting to / from exchange likely to be same. In the same physical building, so same risk of terrorist attack / aircrash etc if you're looking that wide at scenario planning. Route from you to exchange likely to be same too. Suggest you look at your building as well. Do you have a UPS and generator, separate supplies to each router etc.? There's also likely to be some crossover in the backhaul back from the exhange - while will be quite different, it may be going over the same physical fibre at the end of the day, or going through the same routers at some point. In the event of a total failure of BT stuff at your exchange, the latter two are likely to provide more redundancy. so the physical infrastructure is the same (building, power, air-con, street ducting) and possibly some of the back hall from the exchange to the larger 'cloud'. Do all BT exchanges have a UPS / generator, or do we not know this type of information at all... so its pot luck. Battery backup, most have standby generators but not all. Are they still running the generators in the winter and selling it into the grid? Remember that being the bane of my life working for an OLO - slightly dodgy rectifiers / UPS so when the exchange cut from mains to generator all the colo'd DSLAMs would bounce, then again when the generator run was done. If the second "backup" line only comes in to operation when the first fails, have you tested such "failure"? We also had a two line set-up, one working; and the second only supposed to come in to operation automatically if the first failed. I requested that this be tested - refused. So one week-end, I "pulled the plug" on the first line - catastrophe! It came to light that the other end, at the control centre, had not been set up properly.
" Are they still running the generators in the winter and selling it into the grid?" Never heard that one , they do run them up now and then to make sure all is ok with them years ago that was a mates job. Yes, 4 o'clock. Remember well it getting to 3:55 and counting down before the monitoring lit up with red. Yes the 2nd backup line does need to be tested. They go out of service, are decommissioned and are never commissioned. If I get the response that you had then I just say, ok, you are so confident that it works lets go to the computer room and YOU pull the main cable. Lets see if this works. That normally gets someone to think about if this service is working or not. It also means they are not confident about the overall 'backup contingency' and I then attempt to implement 3 mth tests until they are just happy to test on request. Its all a confidence thing. Yes they still do at some places. Thames Water also do the same thing. Its not all just about selling power back out it also cuts there electric bill on some large sites. Google electrical triad periods and that should explain how it all works and why its done.